HMH Books for Young Readers, 9780547363011, 348pp. Life seems to have it in for Franny Flanders. Karma Bites is the first novel by Stacy Kramer and Valerie Thomas. Kramer is a comedy writer, whose television credits include “Lizzie McGuire” and “Less Than Perfect.” She lives in Brooklyn, New York. 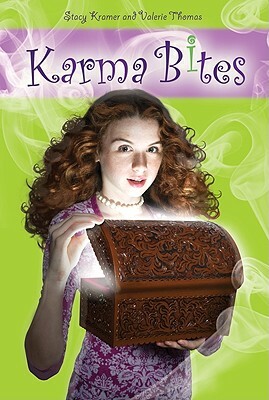 Karma Bites is the first novel by Stacy Kramer and Valerie Thomas. Valerie Thomas is a screenwriter and producer, and has overseen such films as “Ulee’s Gold,” “Adaptation,” and “Philadelphia.” She lives in New Jersey.